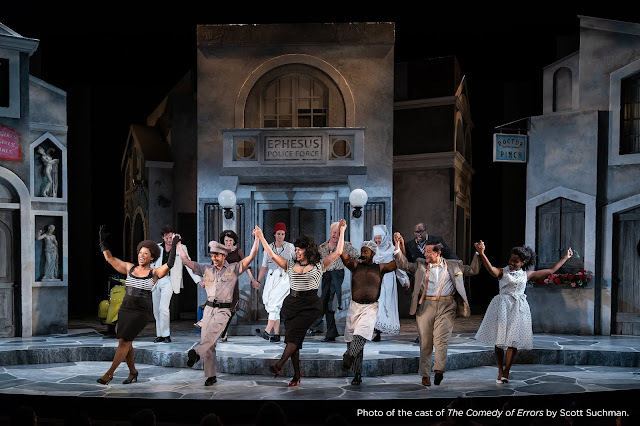 We've seen the ego in their crackingly good production of Henry VIII this fall, and I really enjoyed the commedia-inspired Comedy of Errors earlier this spring. Now it's time for the Nose with Cyrano, Michael Hollinger's new translation of Edmond Rostand's classic play, directed by Aaron Posner. I was quite excited at the casting of Eric Hissom as Cyrano- he was SO GOOD in Mr P's Arcadia and I was really looking forward to his take on the part. Cyrano de Bergarac is one of those roles that's ingrained itself into our popular culture at near Hamlet-levels; I know I for one have seen more takes on the basic romantic plot of Cyrano than I can count, from cartoons to Steve Martin movies. 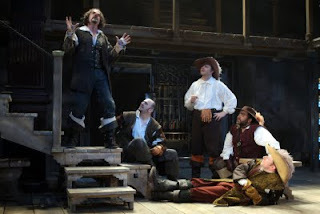 Hissom plays the role with a surprising amount of bitterness- the poetry is there, but this is a Cyrano who's angry about his place in the world, lashing out at the people who would want to help him and inspiring as much wariness as respect. The production doesn't back away from making him a gosh-darned unpleasant guy to be around, and it's an approach that inspires a different kind of sympathy than I was entirely expecting. Hissom is as charismatic as ever, drawing the audience in with his snappishness as much as with his flights of poetry. The moment where his Cyrano stands underneath Roxane's balcony, having serenaded her with words and finally straining up to brush his fingers to the balustrades beneath her feet- that's an image that will stay with me for a long time. The cast is uniformly quite good. Chris Genebach is still working hard to ensure he remains one of my very favorite DC actors- if I knew how to pronounce his last name correctly, I'd start a Steve Holt-esque meme for this guy- and Brenda Withers, in her first role in DC, is a strong and graceful presence as Roxane. Other shoutouts go to Dan Crane, whose final role in the show was perhaps one of my favorites in the whole piece, and Todd Scofield has some lovely comic roles throughout the production. I liked a lot about Bobby Moreno as Christian, but I wonder if there were parts of his character's journey that I missed along the way? His insistence to Cyrano that their charade needed to end seemed somewhat abrupt- the problem with a story like this one is that the titular character is SUPPOSED to be the most interesting person on stage and when it's played as well as Hissom does, I think I might well have missed some important extratextual work from Moreno. If so, my bad- I'd love to watch the show again just to pay more attention to everyone who WASN'T Cyrano. What about the rest of the show, beyond the actors? I'm still not entirely sure how I feel about Dan Conway's set. The rough, unfinished nature of the wood contrasted with the world the actors created to a degree that I found distracting. It could be argued that it suited the winking, metatheatrical aspect of the production, but that's not how it played for me. We might well have been enjoined with some famous words from another poet to piece out the imperfections with our thoughts, but there's a big difference between a set that makes me worry about splinters and the ornately painted stages of early modern England. Devon Painter's costumes and Thom Weaver's lighting design were both gorgeous work, although there sure were some questionable wig choices on that stage... Dale Anthony Girard's fight choreography deserves a nod for its creativity- the audience on press night was chortling in delight, which is not usually the reaction a fight scene gets but was well deserved here. There was so much I liked about this production, but there's something holding me back from loving it unabashedly, and I think it's Michael Hollinger's translation. I agree with Hollinger's program notes wholeheartedly when he discusses his decision to abandon rhymed couplets in this translation: "... this formalism tends to distract me from the play itself, continually drawing my attention to the artfulness of the playwright or translator and away from the predicaments and souls of the characters." THE TRUTHFULNESS OF THIS SPEAKS TO MY SOUL. And yet, this translation veers a little too far to the other side for my taste. Hollinger strove to be "lean, precise, spare, immediate, and actor-friendly at all times," and as a result, we don't see a world where poetry matters, where a drunken slob like Ligniere can fear for his life because of a few lines of satirical verse, and where Christian is the real outsider for his inability to reach the heightened language of lovers. 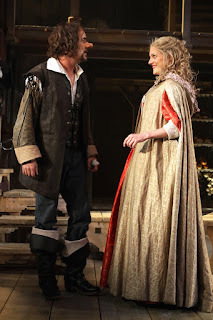 It's a very delicate balance to achieve and it's one of the MANY MANY reasons why I'm not a translator/adaptor, but it did mean that this Cyrano only took flight in a few brief scenes and never quite soared for me. That being said, I enjoyed myself immensely at Cyrano. The Folger has had a VERY good run of shows lately, and this production is no exception. It's well worth a trip down to Capitol Hill and will put you firmly on the 'Eric Hissom Needs to Keep Being Awesome in DC' bandwagon. Head down to the Folger and enjoy the panache.